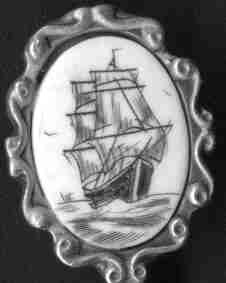 Scrimshaw is an old "folk art" that was practiced by sailors on whaling ships during the late 1700's thru the late 1800's. They would cut fine lines on whale teeth and then would color the lines with a type of "vegetable ink" which would make the picture much more interesting. Now the practice is primarily done by hobbiests although there are a few native Alaskan tribespeople who earn a living from making these scrimshaw for tourists. It is illegal to kill animals for their ivory, but in Alaska and similar areas it is still possible to find old (sometimes petrified) ivory teeth and tusks from whales, walruses, mammoths etc. Note it is also possible to use certain types of plastics. 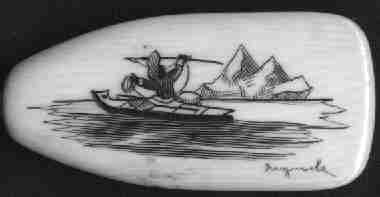 Scrimshaw ivory with picture of eskimo wielding a harpoon. Signed (but I can't read it). The stem and bowl are silverplated. Scrimshaw ivory with picture of eskimo wielding a harpoon. The stem and bowl are silverplated. I did not know who made these scrimshaw spoons since they are not marked. However, I was talking with a very knowledgeable lady named Donna in Skagway, Alaska. She told me that most of these spoons were made by Jim Houston of Skagway for sale to the tourist industry in the 1960's. He is known to have employed native Indian craftsmen to do the engraving work. She also has indicated that these pieces were probably marketed by Herman Krupp of the Oceanic Trading Co. of Seattle.